The Shrug. The Shot. The Flu Game. Michael Jordan is responsible for sublime moments so ingrained in sports history that they have their own names. When most people think of him, they think of his beautiful shots with the game on the line, his body totally in sync with the ball -- hitting nothing but net. But for all his greatness, this scion of a complex family from North Carolina's Coastal Plain has a darker side: he's a ruthless competitor and a lover of high stakes. There's never been a biography that encompassed the dual nature of his character and looked so deeply at Jordan on and off the court -- until now. Basketball journalist Roland Lazenby spent almost thirty years covering Michael Jordan's career in college and the pros. He witnessed Jordan's growth from a skinny rookie to the instantly recognizable global ambassador for basketball whose business savvy and success have millions of kids still wanting to be just like Mike. Yet Lazenby also witnessed the Michael Jordan whose drive and appetite are more fearsome and more insatiable than any of his fans could begin to know. Michael Jordan: The Life explores both sides of his personality to reveal the fullest, most compelling story of the man who is Michael Jordan. Switch back and forth between reading the Kindle book and listening to the Audible narration. Add narration for a reduced price of $14.99 after you buy the Kindle book. "What makes this portrayal especially worthwhile is the long trail Lazenby follows before the awesome career even begins." --New York Times Book Review's "Editor's Choice"
The definitive biography of The Greatest, Michael Jordan. Really good read on the greatest basketballer we will ever see. Really well researched and plenty of different perspectives from family, coaches, teammates, opponents etc which really adds great incite into the greatness of MJ. 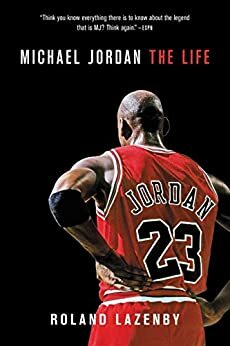 A fantastic and comprehensive biography of Jordan, which goes beyond the Chicago years to the Wizards, Bobcats and Hornets. A must for any fans of basketball or Jordan. I consider myself to be quite a knowledgeable nba fan, but this book furthered my education of the sport. Lazenby's style of describing a story and offering analysis via quotes of those close to situation via quotes is on full display here. This IS the definitive Jordan book.